The worlds most amazing music artist, singing for the world’s greatest need. The above is a modern version, but this one http://www.youtube.com/watch?v=280FERTWG3A and the original version (my favorite), http://www.youtube.com/watch?v=DU4E9vLtxIM are equally as great. Posted in Music and tagged Band Aid, Blue Christmas, Cascade, Christmas, Classics, Do They Know It's Christmas, Eels, favorite Christmas Songs, Happy Christmas, Jesus Revolution, John and Yoko, Last Christmas, Music, OI to the World, Paul Mc Cartney, Techno, Wham by Brent with no comments yet. Where you go, I’ll go!! I love this video from Jesus Culture! Posted in Jesus Revolution, Music and tagged BrenT's ThoughtS, christian, God, Jesus Culture, Jesus Revolution, joy, Kim Walker, love, Music, passion, video, Yeshua by Brent with no comments yet. What can I give back to you, God, for the blessings you poured out on me?? I promise to give back to God all that He’s poured into me. All of my talents, all of my riches, all of my success, all of my heart… they are made by you and for you, Jesus. I will continually give myself to the lost, hurt, and dying world. Thank you for your perfect example of love, for being the first to give, for making me a new creature now reborn to live to give! Posted in Jesus Revolution, Music and tagged Bono, Giving your talent to God, Good News, Gospel, Inspiration, Isaiah 61, Jesus Revolution, Luke 4, Music, Psalm 116, Psalm 40, taking care of the poor, U2 by Brent with 2 comments. Yo P-Funk folks hold your funkadelic funkin’ cause your mothership ain’t got nothin’ on these current heavenly realities… take a trip to the other side, and come ride the ride of your life – it’s the J-train baby!! Posted in Music and tagged fun, funk music, J-Train, Jesus Revolution, Music, P-funk, Toby Mac by Brent with 3 comments. i’m using this post as the oppourtunity, of which it certianly is, to clear up any confusion or delusions that you (the web community) or me-myself-and-I may have ever had or currently have concerning this matter. I am NOT an internet rockstar. Everybody, that knows, knows ben brown is the real ‘internet rockstar’!! Posted in Biography, BrenT's ThoughtS and tagged adventure, austin, ben brown, brent, brent christian, christian, internet rockstar, monte peck, Music, rockstar by Brent with 1 comment. Yes, that was me… circa 2001-2005. I performed with Austin, TX based rock band Down in the Mouth which consisted of famed songwriter, guitarist, and lead singer Monte Peck, drummer Marshall Peck, and yours truly, Brent Christian, We featured an inconsistent revolving cast of bass players, notably… ‘Ex-bestfriend’ Jason Kupka, Derrick the drunk, James LeBlanc the mad scientist, and last but certianly not least, our pale-white rapper (not to be confused with ‘wigger’) and real life comic strip hero Sir Ted ‘teddy boy’ Moore. We had a lot of fun making good and terrible music together. I love all my ex-bandmates/friends and despite all the drama it was, I miss meeting up with them at our old practice place (or at our various renegade spots where we would rendezvous), I miss entertaining on the stage (or at such venues as Austin’s Pizza), and I miss all the songs we played which came to mean a lot to me. Posted in Biography, BrenT's ThoughtS, Music and tagged austin, bio, Biography, brent christian, cd release, down in the mouth, jason kupka, Misty Edwards, monte peck, Music, rockstar, the hanyaks by Brent with no comments yet. There is soo much more on this topic than I will post at the moment, but as God revealed to Misty Edwards, there is a ‘new song’ coming. Much more than just being a new tune, melody, rhythm, or lyrical content…. the new song will actually be new in all those ways, but will also be sung with such a holy spirit power behind it that it will shake the entire earth… Literally. It will not just be a song, but a world-wide stream of awakening consciousness, and that’s what it will sound like! And herald in what is known as the Millennial Reign of God. Who will write the soundtrack to the end of this age? God? No, you will do the actual writing and performing. He will move through His chosen vessels of honor. I pray you accept this calling. Misty Edward’s Dream and her song inspired by it. Posted in Jesus Revolution, Music and tagged Jesus is coming, Jesus Revolution, Misty Edwards, Music, Prophetic Worship, revelation, second coming by Brent with 2 comments. 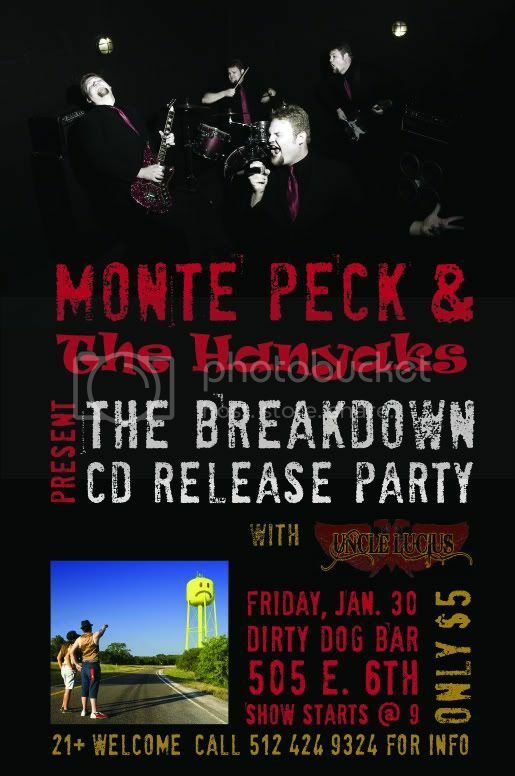 The Hanyaks – CD Release! The Hanyaks have just released their full length album The Breakdown! Posted in Music and tagged austin, cd release, monte peck, Music, the hanyaks by Brent with no comments yet. If you would like to work/partner together, choose an open date from the calendar below and leave a brief note describing why we should meet up or tele-conference. - Thanks!